The Los Angeles landmark that inspired American Horror Story: Hotel! The Hotel Cecil in downtown Los Angeles has seen more than its fair share of suicides, murders and mysterious disappearances since its opening in 1927. Built on Main Street, an up-and-coming area of the city, the opulent, art deco-style hotel promised to draw in affluent tourists and businessmen. Unfortunately, just a few years after its opening, the Great Depression hit, turning Main Street into Skid Row and forcing The Cecil to become a budget hotel. Over the years, The Cecil has certainly made a name for itself. During the 50s and 60s, the location was a popular destination for suicides. Reportedly, it was one of the last locations where Elizabeth Short, more infamously known as ‘The Black Dahlia’, was seen before her body was found bisected and dumped in an empty lot in 1947. The Cecil has also been home to two (known) serial killers: Satanist Richard Ramirez, also known as the ‘Night Stalker,’ and Austrian serial killer, Jack Unterweger. 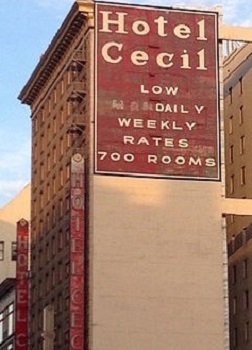 Most recently, the decomposing body of Elisa Lam was discovered inside the water tank at the Cecil after guests complained the water in their rooms was brown and had “a very funny, disgusting taste.” A video of Ms. Lam behaving erratically in the hotel’s elevator went viral and exacerbated rumors that an evil demonic presence resides at The Cecil. The Cecil served as partial inspiration for American Horror Story’s 5th season, ‘Hotel’. But the deaths that have occurred there without publicity far outweigh those that made the news. Read more about the macabre history of the Hotel Cecil at The Post-Mortem Post!